In a trance, Nathan continued, “People start lining up at the restaurant to buy at four in the morning. He doesn’t open until eleven . . . and he closes when they run out of BBQ.” I was intrigued. Nathan was a convert to Aaron’s methodology: salt, pepper, and smoke . . . plenty of smoke . . . smoke with flavors. Nathan now has his own smoker and buys cherry wood pellets on the internet. “I think Costco is going to start selling chunks of cherry wood, soon.” My son Patrick also has a smoker. He gladly helps people clear their yards of cherry, apple and pear trunks and branches to feed his smoker. I’ve had Patrick’s smoked ribs before, so I can only dream of what Aaron Franklin does with his meats. People waiting in line for Franklin Barbecue to open. My parents owned a motel in Ponders Corner. Our home there had a large awning. We could relax in its shade on summer evenings, but I think the reason my dad built the awning was to protect his portable BBQ from the rain. Christmas, Thanksgiving, and Easter usually meant two turkeys. One baked and one barbecued. The rest of the year we ate my mom’s smoked steaks. Well, they weren’t really smoked, they were just over-cooked and generally black. They looked like BBQ brisket, but without the moisture. It wasn’t until I got married that I found out what meat was supposed to taste like. I’m like everyone else, I’m easily swayed by celebrities . . . and good barbecue. 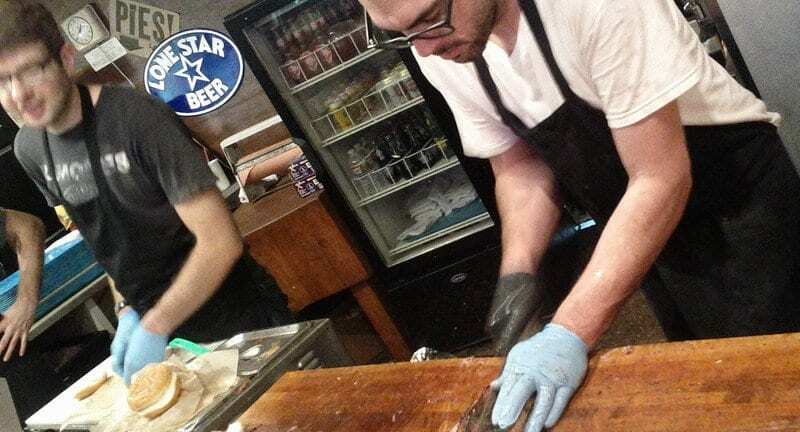 Franklin sells brisket for $22 a pound. It sounded a little steep when I first saw the menu, but then I read a statement by Anthony Bourdain, “It is the best. It is the finest brisket I’ve ever had.” I’m like everyone else, I’m easily swayed by celebrities . . . and good barbecue. I love brisket. Real brisket. I began to think it over . . . I like “filet” at Pacific Grill and that sets me back about fifty dollars for a meal, so $22 is beginning to feel do-able. Before my daughter moved to Seattle to earn Masters degree at UW in Seattle, she lived in San Antonio. Several days before moving, she and a friend made the pilgrimage to Franklin BBQ. Worth getting up really early and standing in line for hours, she said, and there is plenty of great BBQ in Texas. Tell your friend to try Salt Lick BBQ as well. Thanks for reading and writing. From all the comments with Facebook and Suburban Times, Franklin sounds like heaven. Maybe my buddy will bring back a piece of brisket for me. Yeah, right. Thanks again for reading the article and commenting.